This is such a simple, satisfying and forgiving dish. You can use any kind of apples you might have on hand (and you may have many right now). The ingredients are ones you probably also have on hand: flour, baking powder, salt, eggs, sugar, dark rum (which, according to others who made this, is optional), vanilla and butter. The recipes calls for an 8″ springform pan but I read on French Fridays with Dorie that many made it in regular cake pans (not springform), hence the “forgiving.” I think my springform is 9″ so my cake was a little shorter than the photo in the book but still delicious. I suspect you could substitute the rum for any other type of liqueur or flavoring (almond extract, for example). Next time, I will adorn this with powdered sugar and/or a huge dollop of whipped cream. 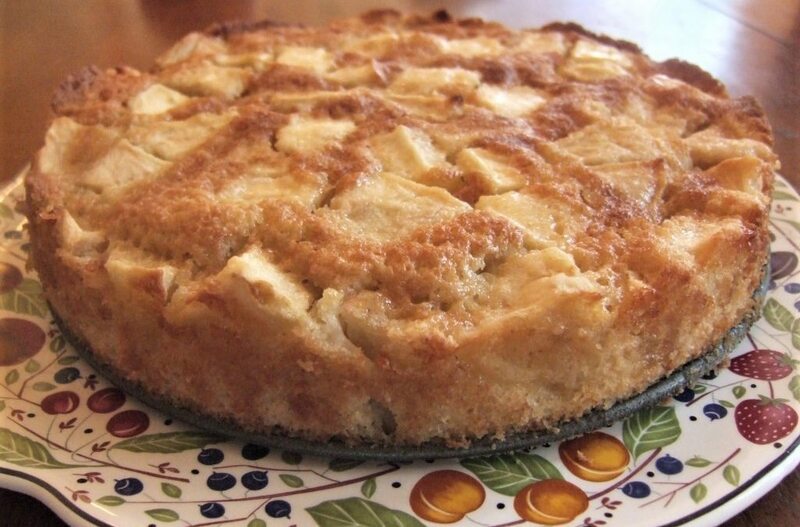 In summary: an easy fall dessert that you can whip up without a special trip to the store that will make the most of your favorite variety of apples. Delish, delish, delish. So PERFECT for fall. Perhaps Calvados in the cake and then Calvados in some lightly whipped cream to top it off? You have me thinking of autumn food. My dark rum is Goslings. Since it’s what I use to make Dark and Stormy’s, I think it might be good whipped into cream to top gingerbread, but I have never tried it. When I do, I’ll let you know if it works. Yes, Victoria, Calvados would be amazing. And do post the rum review! I do really love a dessert that requires no special ingredients.